Standing stones, stone circles, and megaliths have been discovered across the world, but scientists and historians continue to debate their purpose, construction, and meaning. Many theories have been put forward for these creations, from astronomical sites to places of ritual and worship. But perhaps even more puzzling than the meaning of their creation is how they were built with enormously heavy stones long before the creation of the wheel, let alone other modern technology. Below are seven of the world’s most mysterious stones. Around the small village of Carnac in Brittany, France, thousands of ancient menhirs (single upright monoliths) and other types of megaliths stand arranged in rows. The stones have been dated to the Middle Neolithic period (around 3000 BCE) but an exact date has yet to be proposed. There are over 3000 of them, measuring as much as 20 feet high and stretching on for a total of more than four miles. The site includes groupings of megaliths, burial mounds, and enclosures, representing an extraordinary feat of construction for Neolithic peoples. The arrangements are long thought to have served some magical or religious purpose but no one is quite sure what (one popular legend has it that when the Roman army was marching on Brittany the wizard Merlin appeared and turned them to stone). Historians studying the site have proposed that the lines of stones in fact delineate a sacred space, perhaps leading people toward an area of worship. In the 1930s, employees of the United Fruit Company were clearing the jungle of Diquis Delta in Costa Rica when they discovered a series of perfectly spherical carved stones, some just a few inches across, others up to 6 feet wide. Hundreds of the mysterious spheres have since been identified across the region, and many have been adopted as decorations for official buildings. The exact origin and purpose of the stones is debated by archaeologists. Some excavation around the stones still in their original position hs revealed pre-Columbian pottery, linking their existence to ancient pre-conquest cultures, but so many have been moved from their original sites that analysis of their origin and pin-pointing their date of creation has become difficult. Some of the stones were discovered in seemingly astronomically significant alignments, leading some archaeologists to propose that they may have been used for astronomy or navigation. What we know for sure is that the stones are made of hard igneous (solidified from lava or magma) rock such as granodiorite, and were shaped by humans rather than nature. Unfortunately, many of the balls have been damaged or moved by trophy hunters and so today very few remain in their original position—two have even been transported to the U.S., one at museum of the National Geographic Society in Washington, D.C. and the other at a courtyard near Harvard’s Peabody Museum of Archaeology and Ethnography in Cambridge, Massachusetts. Stonehenge in Salisbury, England, is one of the most iconic megalithic sites in the world. The circle of stones was built starting around 3000 years ago by Neolithic peoples, and the blue stones that make up the ancient monument have been traced to quarries in Pembrokeshire, Wales, hundreds of miles from where the circle now stands. Historians have theorized that the stones were transported the long distance on rafts down rivers and then pulled along on wooden sleighs using rollers, a process that must have involved months of hard work. The stone circle is just part of a series of ancient structures across the landscape of Salisbury Plain, with earthworks, ditches, and Bronze Age burial barrows. 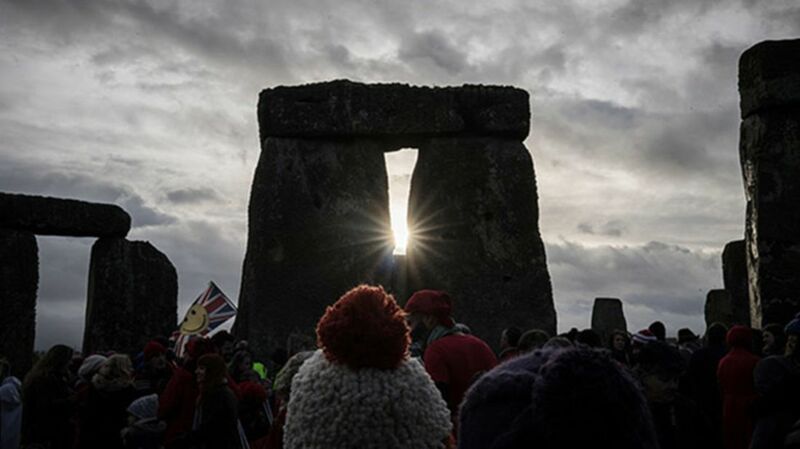 The site has long been a sacred space and even today pagans gather there to celebrate on the winter and summer solstices. The deer stones are a series of over 1200 ancient standing stones scattered across Mongolia and Siberia, given their name because many of them include elaborate carvings of flying deer. The stones range in height from about 3 to 13 feet and are often grouped together, sometimes associated with ancient burial sites. Scientists believe they were erected over 3000 years ago by Bronze Age nomads. The carvings include not just deer but elk, people, and representations believed to be the sun and moon. The intricate carvings would have taken a lot of skill and so historians think the stones may have been dedicated to great warriors or chiefs, but their exact purpose can only be guessed at. The world’s largest prehistoric stone circle is found in the quaint English village of Avebury, not far from Stonehenge. The circle originally contained some 100 stones and encircled two smaller stone rings. The stones are thought to form part of a wider ritual landscape, which was built and altered from about 2850 to 2200 BCE; archaeologists think that the circles, henges, and avenues of stones formed part of a public space for religious ceremonies, but their exact use or the nature of these ceremonies remain a mystery. In the 1930s, an excavation by archaeologist Alexander Keiller revealed a grisly secret when a skeleton was discovered crushed underneath one of the stones. The body did not belong to one of the Neolithic builders, but rather a man from the fourteenth century who was crushed to death when trying to move the pagan stones. A huge prehistoric burial site in South Korea spread across the areas of Gochang, Hwasun, and Ganghwa contains hundreds of ancient dolmens—tombs built from large stone slabs. These Neolithic and early Bronze Age structures are made from two or more stones, topped with a large capstone, forming a marker for a burial site. The sheer number of dolmens is the most surprising aspect of this World Heritage Site, with thousands dotted across the Korean landscape—the highest concentration of dolmens in the world.